One thing's for sure, if you didn't watch "Celebrity Big Brother" before, you're likely watching now. Or, you're at least watching the live feeds & clips because that's where the REAL entertainment is. Tamar Braxton has been making headlines left and right since entering the "Big Brother" house with her housemates. She has gotten in several spats with the other houseguests, including Kandi Burruss, Lolo Jones, Ricky Williams and most recently, Kato Kaelin. When she's not fussing and fighting, the "Love & War" singer has been opening up about her personal life. And the tea spillage is interesting to say the least. During a conversation with new BFF Kandi about parenting, Tamar revealed she lets her 5-year-old son Logan Herbert, whom she shares with her estranged husband Vince Herbert, sleep in the bed with her and her boyfriend, whom she affectionately calls "T'Challa." Oh? The conversation came up as the ladies were talking about how they got their installed structure in their kids and got them to sleep in their own beds. "See, Logan's 5. He be in the bed with me and T'Challa. Sleep!," the "Braxton Family Values" star shared. Your husband don't be mad about him sleeping in the bed with another man?," the "RHOA" star asked Tamar. "We're not together! That’s not really his business,” Tamar said. We find this VERY hard to believe, but mmk. Kandi then asked her how long has she and "T'Challa" been dating and Tamar revealed it has been six months. The R&B songbird opened up again about her Nigerian lover. 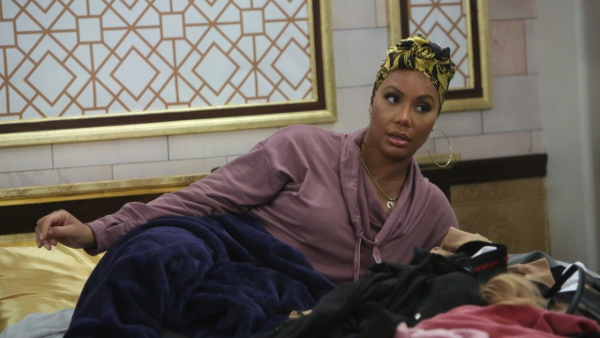 During a conversation with Lolo - who is biracial - about dating outside of her race, Tamar revealed that she was over black men after calling it quits with Vince. "T'Challa", though, swooped in and stole her heart. The kicker? "T'Challa" apparently wasn't even checking for black women before he got with Tamar. Tamar never got the chance to date on the "other side" because she ended up meeting T'Challa. And it seems Tamar herself has a type. You may recall, Tamar previously said Vince's preference before they got together were women with blonde hair. “You must be doing something right,” Dina Lohan joked. "I am the prototype," Tamar laughed. Check it at the 3:00 minute mark above. She seemed flattered that a man who doesn't prefer black women shows interest in her, which to us, is a RED flag. The fact her soon-to-be ex-husband told her "he doesn't date black women" and "prefers blondes" - remember that episode of "Tamar & Vince"? - is very likely part of the reason her marriage didn't work for her. Yet, she's going down the same path again. But we digress. The fact that both men told her they prefer white women or "others" would have us side-eyeing them from jump. As for the divorce, Tamar requested to have the judge sign off on it back in October 2018 since Vince won't respond. Tamar is seemingly doing something right in the BB house. She recently won the "Power Of The Publicist" award, which she can pull out at any time to save her from the chopping block. BB watchers love sh*t stirrers, trust us.